Jimmy Dean is an American actor and country music singer. 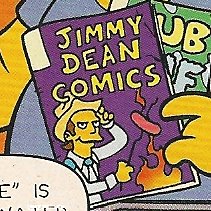 When Ralph Wiggum wanted to sell some comics to Comic Book Guy, one of the comics he sold was a copy of Jimmy Dean Comics. Comic Book Guy said that there was booger stuck between the pages of the comic. Modified on August 15, 2012, at 17:59.